This is a story about the life of two rural families live in an old haunted house at Cloudstreet. The two families are Pickles and Lamb. Pickles family believes in luck whereas the Lambs family believes in God. The story involves wide variety of characters and the ups and downs of their lives. Besides that, it tells the story of the creepy things happening in the haunted house and also a talking pig. It might be difficult to read for some people as the story has a lot of Australian language. This happens to me as well. It took me some time to understand the slang. However, I still like the novel and I feel it's really worth for reading. The novel is well-written and the story is very lively. It's funny, amusing, sad, and eccentric. The only thing I don't like about this book is a bit lengthy. I was a bit struggling to finish the book when it comes to the end. 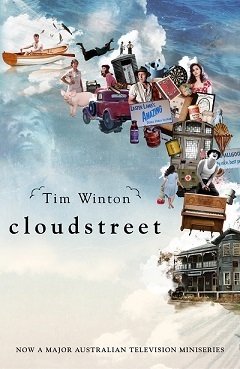 More reviews can be found on Goodreads: Cloudstreet.